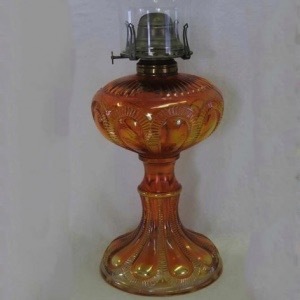 Pattern Description: Found in various sized oil lamps including finger lamps, table lamps and sewing lamps. The base and oil reserve have large lines that loop up and connect to other lines resembling a zipper. The pattern is dominated by serrated loops (plain inside) that come up from the bottom of the font or go down to the edge on the stand . According the to pictures in the 1909 Imperial Glass Co., book, there are three different styles or types. The stand style is the most frequently seen lamp and it comes in 7 sizes. The sewing style just comes in one size and has a much larger font (presumably to hold more oil so the seamstress didn't need to refill the lamp as often). 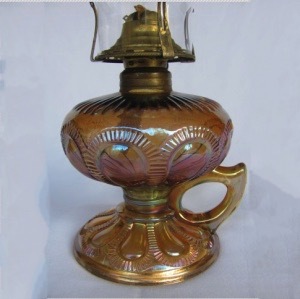 The hand or finger lamp comes in three sizes and has a small handle between the base and the oil font. The lamp is measured by height (anywhere from 4 3/4″ to 11 1/8″) and base (anywhere from 3 1/2″ to 6 1/8″), but the base sizes are generally used to identify the actual lamp size. 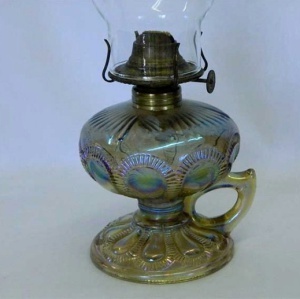 These lamps were reproduced by Imperial Glass Company, and are marked with an IG inside the bottom (it may be easier to feel than to see). 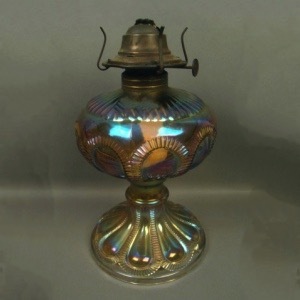 The reproduced stand lamps were done in marigold and smoke; they did reproduce a version of the finger lamp, but it does not have the same handle or base and was not reproduced in carnival glass.